If you thought remodelling houses and homes is a new thing, think again. By 1960, the buiding contained three home and two businesses: Fred Toon's painting and decorating business on the left, Mrs Payne's home on the far right, and the opticians where I was fitted for my first glasses, aged about five years old, to the right of the center. The middle chimney has disappeared, and a new one has been added. The small, leaded window panes have been replaced with plain glass sash windows, and the shutters have gone. The central, grand front door has disappeared. Now I want to go back in time and see the house as it was, before all this remodelling was done. Who lived there? What did they do? Who took the house and divided it? Was that a tradesmans' entrance on the far left, or was it a separate home? Or... even earlier, was it four homes? Because that makes sense, too, structually, from my memories of grandad's half of the building. How many times can you remodel a home? So many questions... and still no time machine. 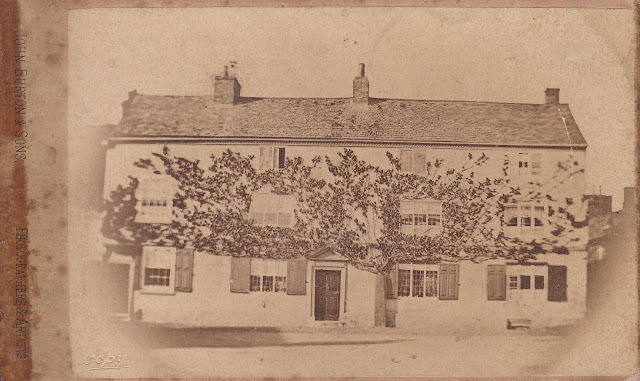 Much thanks to Ray Young, Syston, and the Syston Town History Society for sharing the top photo. It's from a Victorian "carte de visite", and was part of my uncle, George Toon's, collection.